Simply irresistible!!! That are the two words I would use to describe this incredible book. The world that our main characters live in is so amazingly developed that I felt as if I was living there with them. Our main character in this story, is Ana and she is pretty much an outcast in this incredibly developed world. She lives in a place where everyone around her has known each other for thousands of years, each soul has been reincarnated, but when Ana is born she isn't a soul everyone knows. She is brand new and that freaks everyone out, well almost everyone. I loved reading every page of this book and as Sam's and Ana's Relationship grows, I found myself smiling while reading every sentence. Sam sticks up for Ana, saves her life, and...well falls her the beautiful Ana. He also teachers her so much and shares the love of music. So much comes up against Ana and Sam in this story. Sylphs, dragons, people angry about Ana being in the city, the council, Ana's Mom, and so much more. Plus, they aren't sure, if she dies if she will actually come back. She might die and never be reincarnated, she could be gone forever! That's something they both fear. Another big problem is that everyone in the city is so scared of her, yeah she starts to make some friends, but some of the people wont even give her a chance. Even Ana's Mom is so terrible to her in this story, so bad that I was yelling at her while I was reading. I wanted to jump in there and deck her myself. All in all this was a beautiful and amazing story. Very original! Very different! The great thing is Incarnate is only the first book of this series. We get more of this great world, story and characters. I loved how the author, Jodi Meadows, kept the reader (me) on my toes the whole time. I asked so many questions reading this book and throughout it she answered some of them and some she didn't, when she did it wasn't the answer I was expecting. Incarnate is defiantly one of my favorite books of this year! Jodi Meadows, created a well thought-out world and brought it to life through her words and her characters were so lovable that I wanted to reach out and hug Ana. I so wanted to tell her that her mother was so wrong and she isn't a Nosoul she is a beautiful soul. As for the Cover, it only takes me one word to describe it: Breathtaking! It fit the book perfectly. Just because your different doesn't mean your not special and beautiful! It also teaches us to take chances on the people who are different, they might surprise you. And in reality we all have something in common. You don't know someone unless you try to get to know them! 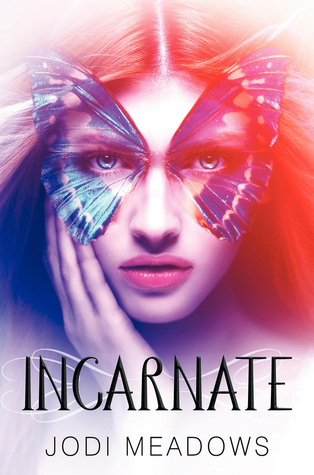 Incarnate is perfect for young readers and adults alike. I will say this, this story deals with souls, which is a powerful topic. 100 out of 100 = 5 puppies!!! Incarnate is definitely a book you need to add to your collection. Its a book you will never forget!!! Hiya, lovely review! And I really enjoy reading through your blog too. Great review. I definitely want to read this soon!